Actions in one part of the world often affect outcomes in another. 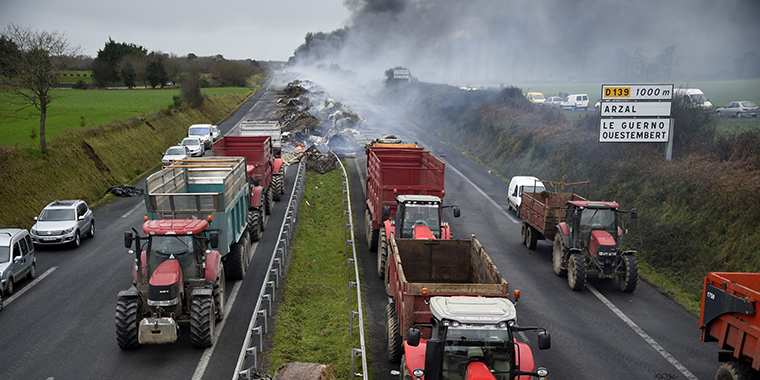 French farmers take part in a blockade on a motorway near Arzal, western France, on January 29, 2016, during a protest against the falling of prices of their products. What do a referendum in Crimea, an economic downturn in China, a drought in New Zealand, a policy change in Brussels, and cow herders in West Africa have to do with farmer protests in France? Hint: It has something to do with globalization. When European milk prices hit historic lows in 2015 and 2016, French farmers took to the streets: they drove tractor brigades down local highways, exchanged sour words with politicians on TV, intentionally spilled liters of milk on roads across the country, and waved signs that read “I’m a farmer, I’m dying.” They used dramatic tactics to show that their livelihoods—heavily dependent on a global market—were under threat. Even though their protests took place in France, a domino effect of events in far-flung countries laid the groundwork for the farmers’ frustrations. Understanding how seemingly unconnected events and policies led French farmers to protest on the streets illustrates just how tightly globalization links all kinds of people and industries, whether they realize it or not. Among other reasons, the appearance of Russian troops in Crimea prior to the referendum, which was held despite objections from Ukraine, made the United States and the European Union dispute the vote’s legitimacy. They were concerned about what they viewed as a threat to Ukraine’s sovereignty—a foreign power essentially making territorial decisions for it. In response, they imposed sanctions on Russian individuals and businesses. Russia followed suit, banning imported produce, including dairy products, from Australia, Canada, Norway, the United States, and the European Union. This change was huge because until 2014, Russia had been a significant importer of European agricultural products, including French milk and cheese. As a result of the sanctions, trade between Russia and France plummeted 35 percent in 2015. Source: World Integrated Trade Solution, World Bank; UN International Trade Statistics Database. China is one of the world’s largest—sometimes top—dairy importer. In 2014, the bulk of China’s imported dairy products came from New Zealand. After New Zealand experienced a prolonged drought, China started buying more milk from France. But in 2015, two things happened to change this trend: The Chinese realized they had overstocked on milk and demand plummeted. Simultaneously, China endured an economic downturn. As a result, French dairy exports to China fell by over 13 percent. In addition to the markets in Russia and China contracting, French dairy farmers found they could not even sell their excess supply domestically, as rates of milk consumption had dropped in France. Exacerbating the problem, the European Union had decided to lift long-standing quotas, or limits, on dairy production, a move that added to the growing supply and further drove down milk prices all over the European Union. By the beginning of 2016, milk prices in France had plummeted nearly 20 percent, meaning French farmers were taking home significantly less income from the milk their cows produced. The EU eventually stepped in with aid packages, offering 500 million euros, or about $585 million, in aid to its dairy farmers. But no quota on milk production was reintroduced, which meant that European producers could continue to produce as much milk as they wanted. They just needed to find a place that would buy their milk—and, with the European market saturated, they turned their attention to Africa. Africa is an especially attractive market for dairy, as the continent boasts both the youngest and the fastest-growing population in the world—and, in the case of West Africa, some of the fastest-growing economies. Between 2011 and 2016, milk powder exports from the EU to West Africa roughly tripled. Most of it went to plants in Ghana, Ivory Coast, Nigeria, and Senegal, which reconstitute the powder into liquid milk and sell it to neighboring countries. Arla, a Danish dairy company, saw nearly 16 percent growth in revenue in sub-Saharan Africa in 2016 (compared to 1.3 percent growth in its European operations). Although African dairy farmers have been able to produce enough milk to meet local demand, experts warn that the milk pouring in from EU farmers risks drowning the local dairy industry. Globalization will continue to affect local industries—and consumers, too. Over the past couple of years, the French milk protests have gently subsided, although gilets jaunes protests in France, focused on economic inequality and issues beyond the agricultural sector, remain active. (Gilets jaunes is French for yellow vests, the high-visibility vests that all drivers in France must keep in their vehicles and wear during emergencies.) Farmers were able to win some price increases in 2017 and 2018. And in fall 2018, the French government passed significant agricultural legislation, including a farmer-friendly reform relating to agricultural prices. Yet as the milk crisis lingered in 2017, an apparent shortage of butter captured French headlines and the worried attention of croissant lovers. In reality, French farmers were producing enough milk to meet the demand for butter. But instead of selling their butter domestically, they turned to markets abroad where their products fetched a higher price. From the United States, where butter consumption hit record highs, to China, where the love of French-style pastries was on the rise, the demand for butter was high. And because New Zealand’s cows, still suffering from climate-related issues, were producing less milk, overall supply was low. French farmers, whose livelihoods had suffered from a series of global events just a few years earlier, capitalized on the global demand for their products, leaving the shelves of French supermarkets temporarily bare. So the next time you buy milk or butter from your local store, remember that the price you end up paying, and sometimes even your ability to buy something in the first place, is often influenced by the diverse effects of globalization, from market forces to shifting government priorities, unpredictable climate change events, and countries’ foreign policy decisions.